Do you clutch the wheel a little tighter as you pass a semi or other large trucks? You’re not alone. Semis and large trucks navigate the roadways differently than other vehicles. Learning what they need — and what you can do — can help you safely share the road with large trucks. Longer stopping time. A large truck’s size and weight increases its stopping distance. For example: If large trucks are going 65 miles per hour, they could need up to 200 yards — nearly the length of two football fields — to stop. Slower reactions. Most vehicles can merge quickly. Large trucks can’t because of size. Follow these tips to safely share the road with large trucks. Pass safely. Always pass on the left — the blind spot is smaller on this side — and maintain a steady speed. Give them space. 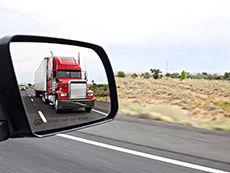 Keep a safe following distance — four seconds or more — between you and large trucks to help avoid dangerous situations, such as sudden stops (and subsequent rear-ending), a truck rollover over in high wind, a tire blowout or a wide truck turn. Note: If you can’t see the trucks mirrors, they can’t see you.